To be determined. Ask us how you can help! 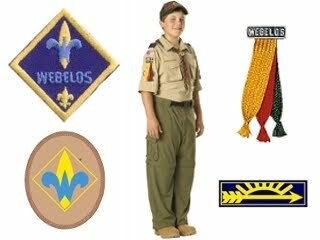 Our Goals Webelos is a 18 month program for 4th and 5th grade boys to prepare to join a Boy Scout troop while learning outdoor skills and participating in 20 different activity badges. A well-run group of Webelos is a gradual change from being an 'adult-run' den to being a 'boy-run' patrol ready to fit right into an adventurous scouting troop. Summary The "WE'll BE LOyal Scouts" program has two major milestones - the Webelos rank badge to be earned at the 4th grade level and the Arrow of Light to be earned at the 5th grade. The final part of Webelos is bridging over into a Boy Scout troop selected individually by the scout. Visit our Why Cub Scouts? page and our Join Us! page for great reasons to be a Cub Scout in Hugo. Email join.pack151@gmail.com for more info about our den and our pack. We'd love to hear from you about your interest. Congratulations Den 4! Congratulations to our Den 4 Webelos Scouts for all earning their Arrow of Light Awards. We wish them well as they join Hugo's Boy Scout Troop 151!